"Entrance Not for Everyone. For Madmen Only." so what's good for ALL humans, animals and plants? The initial question that exists in almost all political parties: "What's good for the people in country xyz?" we would like to leave behind. Politics, which focuses only on the well-being of one nation and its citizens, we no longer find contemporary and therefore reject it. The OWM is thus THE party of globalization, but not the previous, largely national-opportunist globalization. In today's wonderfully intertwined world, the biggest challenges, such as equal opportunities, nutrition, peace, fair trade, climate change, resource allocation and environmental protection can only be achieved through strong global agreements. In order to reduce massive economic imbalances, we are also committed to significantly more GLOBAL SOLIDARITY, so solidarity with EVERY earth-dweller. 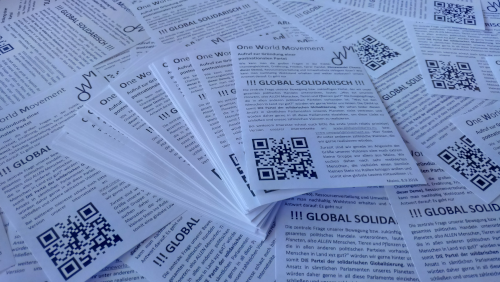 The OWM sees itself as a peaceful force that wants to strengthen transnational structures in many areas and completely abolish national borders. We do not want to formulate clear ideas for an ultimately post-national, global political structure of order right from the beginning, because the division of competencies between global and local structures in many political issues today is not completely thinkable. Rather, we want to rethink these structures during the implementation of many concrete, global visions. In order to implement these progressive visions, the OWM would like to introduce itself as a democratic party into all national parliaments and in parallel establish a transnational organization of the OWM.